Best All-Around Bag Review by Steve A.
I have two of these, the 36" and the 30". I use them for just about everything; from skiing to some of the worst camping conditions. They do as great of a job of keeping water out when unprotected from the elements as they do when I have to toss wet gear in it to protect my car from a weekend of slogging in the mud. 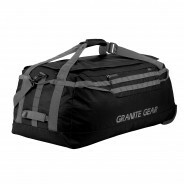 Normally a large duffel is bulky and difficult to transport. However, with the padded backpack-style straps, I can carry a great deal of gear in a smaller standing footprint.